The Chinese-American Oceanic and Atmospheric Association (COAA) and the China Meteorological Society (CMS) are pleased to announce their cooperation in organizing the 7th International Conference on Atmosphere, Ocean, and Climate Change this summer. 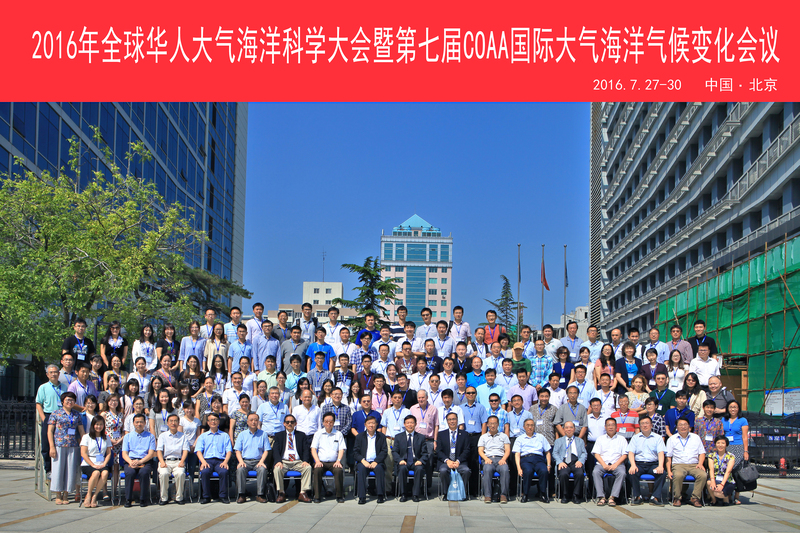 The conference will be co-sponsored by China Meteorological Administration (CMA), China State Ocean Administration (SOA), Chinese Academy of Sciences/Institute of Atmospheric Physics (CAS/IAP), and China National Natural Science Foundation (NSFC), and held at the CMA campus in Beijing on July 27-30 2016. This series of conferences has been a main gathering event of Chinese American oceanic and atmospheric scientists and their colleagues and have been held in U.S., Taiwan, Hong Kong and mainland China. The conference aims to bring global Chinese professionals on ocean and atmosphere science and technology to exchange ideas and experiences in the practical application of innovative sciences and technologies related to ocean and weather observing and forecasting systems, climate change and global warming. The conference is the premier platform for experts from all over the world to explore new technologies, inspire new strategies, and identify opportunities for future collaborations with their peers. It is also a means for senior scientists and engineers to provide helpful information for younger ones to stimulate the knowledge transfer from generation to generation. On behalf of the conference organization committees, I would like to invite your participation in this once every 3-year event. We look forward to seeing you in Beijing this summer. Abstract Submission Due Date: 05/27/2016. Online Registration Due Date: 06/30/2016. Online Registration Fee Payment Due Date: 06/30/2016. For any inquiries on online registration and payment on special circumstances, please contact coaa2016@coaaweb.org directly for assistance. Look forward to seeing you in Beijing in July 2016!